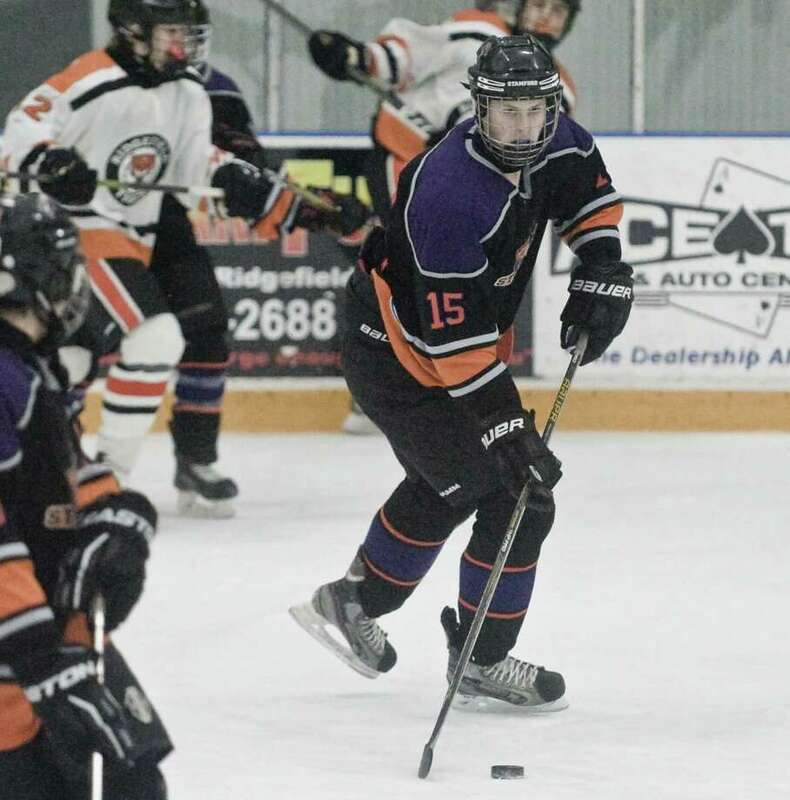 When Ridgefield’s Nick Cullinan scored just 35 seconds into Wednesday afternoon’s FCIAC boys hockey semifinal, it was a sign for the Westhill/Stamford co-op team. A sign of major trouble ahead. Unbeaten Ridgefield registered five goals unanswered goals in the first period and three more in the second to overwhelm the fourth-seeded Vikings, 8-1, at the Winter Garden Ice Arena. Top-seed Ridgefield (21-0-0) — No. 1 in the GameTimeCT poll — now has the chance to win a third straight conference championship when it plays sixth-seed Greenwich in the finals on Saturday (6 p.m.) at Dorothy Hamill Rink in Greenwich. Westhill/Stamford (12-10-0), which was coming off a 5-4 win over fifth-seed Fairfield in the FCIAC playdown round, will await the start of the Division II state tournament. After Cullinan’s early goal (on an assist from Will Forrest) gave the Tigers a quick lead, Westhill/Stamford held its deficit to one goal for nearly seven minutes. But Matt Walker scored three consecutive goals — the last two in 31 seconds — and Luke Welsh added another before the first period ended, pushing Ridgefield’s lead to 5-0. Cullinan had the primary assist on each of Walker’s three goals, and Henry Garlick supplied the helper on Welsh’s goal. The onslaught spilled over into the second period, as Owen Luft, Cullinan, and Forrest scored to make it 8-0. Westhill/Stamford avoided a shutout when Eddie Zelickman converted off a two-on-one with six seconds left in the period. Neither team scored during an uneventful, fast-moving third period in which Ridgefield seemed content to not pad its lead. NOTES: Cullinan finished with five points (two goals, three assists). Walker had three goals and an assist, and Forrest added a goal and two assists as Ridgefield’s top line combined for 12 points. … Kevin McNicholas contributed two assists, and Garlick and Daniel Parson each had one assist. … Ethan Skaug assisted on Zelickman’s goal for Westhill/Stamford. … Ridgefield outshot the Vikings, 46-11.